There are several things to keep in mind when setting out to buy running shoes. If you purchase a shoe that is not right for your foot, you may suffer the consequences. Many running injuries are a direct result of a poorly selected shoe. While it's quite common for a running shoe to feel good in the store, the true test of whether it's right for you comes many miles later. That's because the right shoe for you is determined by your running gait, the shape of your foot, your weight, and other factors unique to you! So, where do you start? 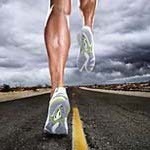 If you have a local running store near you, consider going in for foot and gait analysis. These guys are experts in shoe fitting and can narrow down the options and help you choose something that is going to work for you. And, many of these stores offer exchanges even after the shoe has been worn if a runner is experiencing problems. If you don't have a running store near you or you just want to be informed about the art of running shoe selection, check out these tips and be on your way to a great fitting shoe and miles of pounding the pavement! 1. Support. 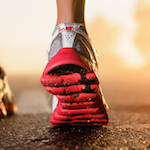 How much support do you need in a running shoe? First, determine what kind of arch you have. A quick and easy way to find this out is to get the bottom of your feet wet and then step onto a paper towel. You can tell by the print if you have a flat foot, low arch or high arch. If you find that you have a high or normal arch, look for a cushioned shoe. If you find you have a low arch or flat foot, look for a stability shoe. The stability shoe will help minimize overpronation that is common with a low or flat arch. 2. Size. Experts advise purchasing a running shoe that is a half size larger than your street shoe. This is to allow your toes to flex and move forward with each foot strike. There should be a thumb's distance from your longest toe and the end of the shoe. Also, trying on shoes at the end of the day is better than earlier in the day because feet tend to swell during the day. 3. Price. A good pair of running shoes should last 300 to 500 miles. Considering this, paying $130 for the perfect shoe for you is not a bad investment and is worth the money if it helps to keep you injury free. This isn't to say that there aren't perfectly good running shoes in cheaper price ranges. Just make sure not to skimp on price if it means a subpar shoe that may end up costing you more money in the long run. Which would you rather spend money on: a good shoe or P.T. sessions? 4. Purpose. 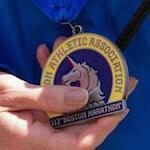 Are you a long distance runner or a short to mid-distance runner? This is an important factor to consider when purchasing a running shoe. If you run short distances, you may not need as much cushion as someone who is marathon training. The less cushion in the shoe, the lighter it tends to be, so if you're going for speed, you may want something not quite as heavy. Many runners have a shoe they train in and one they race in. Determine what is it you are trying to achieve and go look with that in mind.